Patients diagnosed with pulmonary embolism (PE) range over a spectrum of severity from “possibly discharge” to “cardiac arrest”. Only 5% presents with signs of shock and are considered massive. Those without shock can still have considerable morbidity and mortality. Cardiac biomarkers such as brain natriuretic peptide (BNP) and troponin can be used as markers of right ventricular dysfunction. Transthoracic echocardiography is also used to evaluate for right ventricular (RV) dysfunction in the setting of PE. A combination of focused echocardiography by an emergency physician, serum cardiac biomarkers, and right ventricular assessment on computed tomography (CT) offers potential to be a readily available and accurate risk-stratification tool. How accurate is goal-directed (AKA focused or point-of-care) echocardiography for RV dysfunction? How accurate are serum cardiac biomarkers and CT for RV dysfunction? Did not evaluate whether earlier diagnosis of RV dysfunction could have resulted in change in patient centered outcomes such as time to intervention, length of stay, etc. 2. 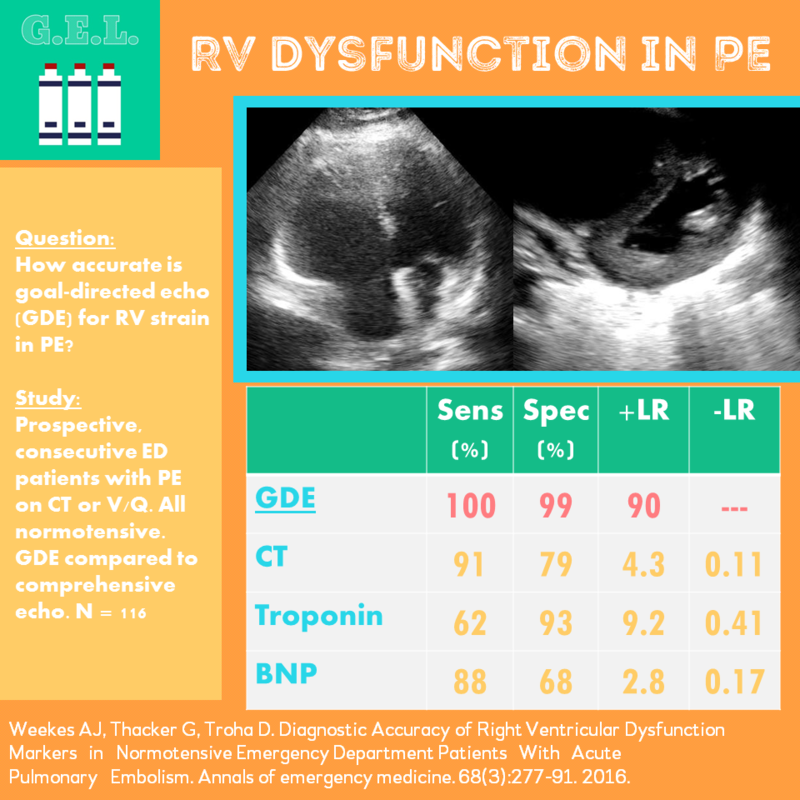 Goal-directed echocardiography out performed cardiac biomarkers and CT findings in assessing for RV dysfunction in the setting of PE.